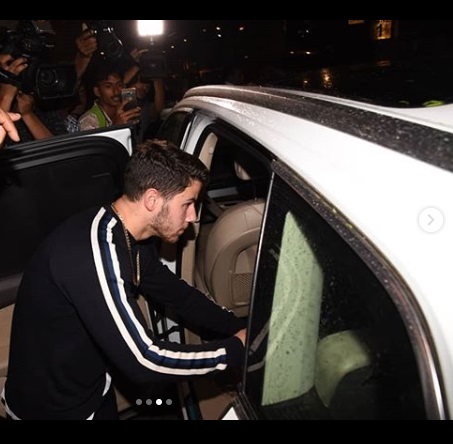 Priyanka Chopra’s beau Nick Jonas and his parents arrived Mumbai airport for engagement bash. The rumors is turning out to be true for Priyanka Chopra and Nick Jonas’ fans about the couple’s relationship news. Of-course for all the good reasons. We told you yesterday that Nick Jonas is flying to India with his parents to set a meeting with his girlfriend Priyanka Chopra’s mom and her family. It is first time for Nick Jonas’ parents Denise and Kevin Sr.’s in India, whereas Nick had earlier come to India with Priyanka Chopra and met her mom Madhu Chopra. The internet was buzz as the couple also had a mini vacation in Goa with PC’s siblings. Talking about Priyanka, she has already won the Jonas family since the time she attended as plus one with Nick Jonas at his cousin Rachel Tamburelli’s wedding in New Jersey on June 9. Though we couldn’t spot, it is rumored that Priyanka Chopra was at the airport to receive her beau Nick and her soon to be in-laws. Nick’s parents looked absolutely happy and say what! We also spotted Nick’s dad carrying Tiffany & Co bag, hhmm, the same shop from where Nick picked an amazing 5 carat diamond ring for Priyanka which is 200,000USD worth. Looks like Priyanka is yet to receive more sparkling things from her in-laws. We won’t drag much and let the pictures do the talking. Just two days ago Priyanka Chopra debut her diamond engagement ring. We understand now why she was cool to flaunt it off and not keep it anymore secret. She is soon making her relationship with Nick Jonas official, guys. Speculations are rife that Priyanka Chopra and Nick Jonas will formally get engaged on August 18th, Saturday with family and close friends in presence. Stay tuned, Eventznu will bring you the all the latest scoops from Bollywood. Next : Priyanka Chopra – Nick Jonas’ Family Dinner With Parents Before Their Engagement Bash!